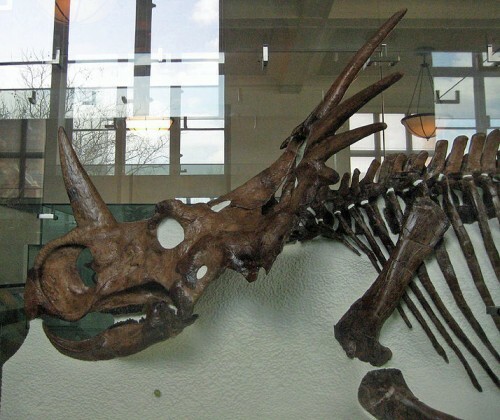 The Styracosaurus (or “spiked lizard” in English) is a herbivorous ceratopsian dinosaur. It lived during the Cretaceous Period’s Campanian stage which was about 76.5 to 75 million years ago. It was scientifically named and described in 1913 by Lawrence Lamb. 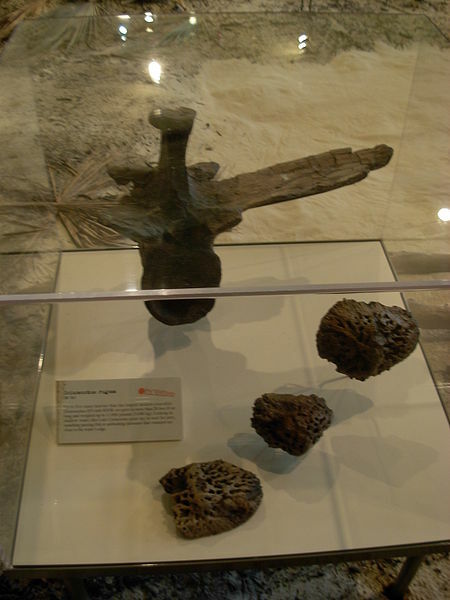 The Styracosaurus was a large dinosaur. It was 5.5 metres long and weighed about 3 tons. It was about 1.8 metres tall. This dinosaur had 4 short legs, a short tail, and a bulk body. Its beak and shearing cheek teeth were arranged in a continuous dental battery form which suggests that the Styracosaurus sliced up plants. A distinguishing feature is its frill and horns. It may also have been a herd animal which travelled in large groups. Evidence to prove this is found in the bonebeds. 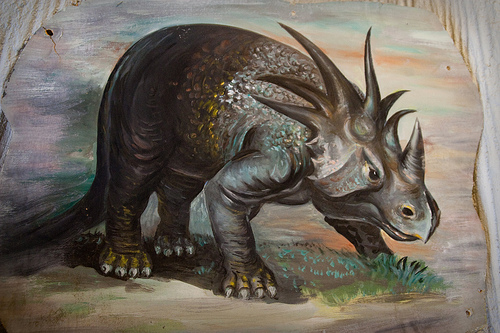 Due to the spines, horns, and hooks attached to the Styracosaurus’ head, this had led to its appearance in films even since the earliest days of motion pictures. These include 1933’s The Son of Kong, The Valley of Gwangi (1969), The Land That Time Forgot (1975), and Disney’s film from 2000, Dinosaur. It was also included in Jurassic Park (the book). On the small screen, the Styracosaurus has appeared in anime and cartoons such as Power Rangers: Dino Thunder, Dinozaurs, Dinosaur King, Dino-Riders, Dinosquad, Dinosaucers, and Zoids. It has also been featured in video games such as Jurassic Park, Zoo Tycoon, Turok, and Banjo-Kazooie.